We are rudely awakened at 5am by elevator music being incessantly piped into our cabin and a lady with received pronunciation announcing that the ship is coming into port. Mario and Luigi are still feeling nauseous so Toad opts to take the wheel for the first leg of the journey on the wrong side of the road. 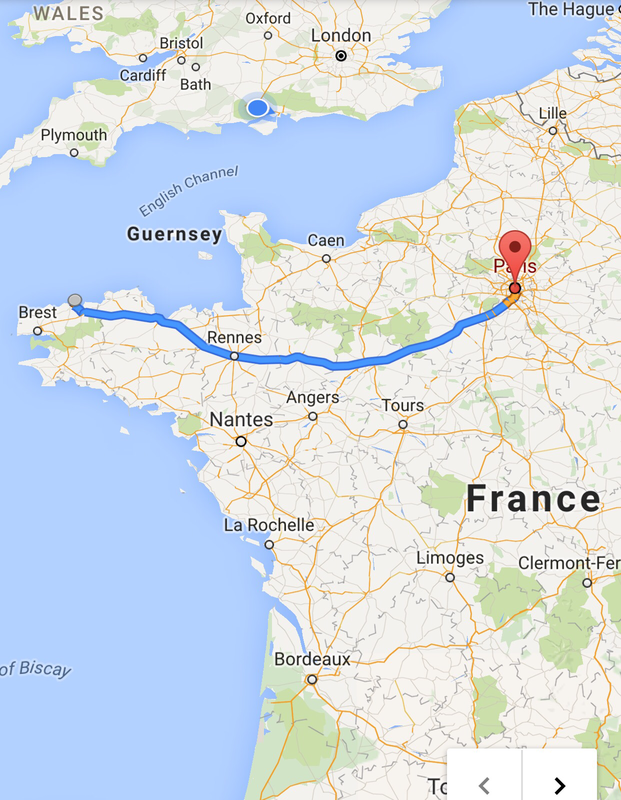 Within minutes we’re off sailing through the French countryside. 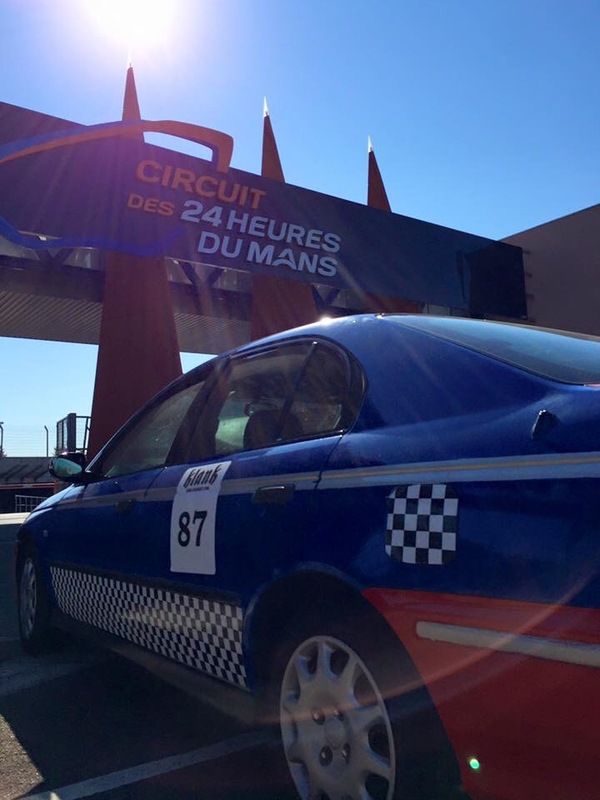 We take our first pit stop at Le Mans race track en route before pulling into a village called Champagne. 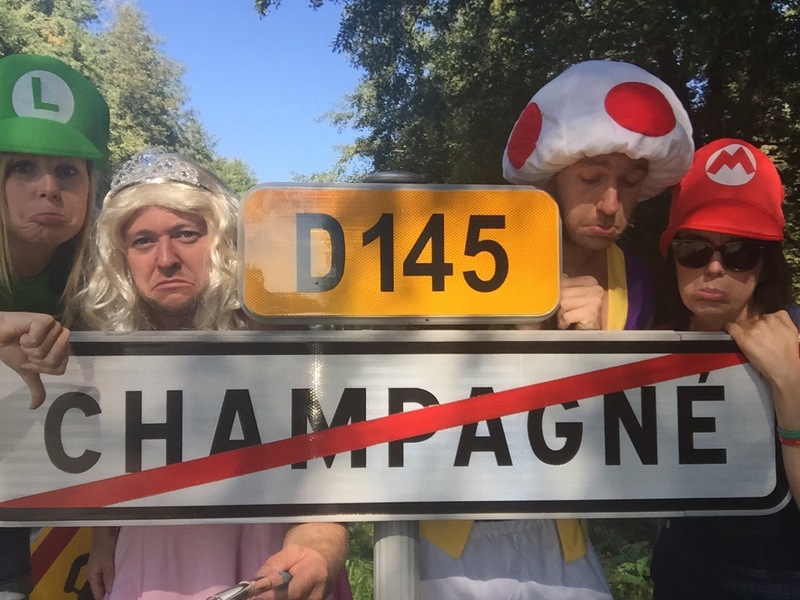 It has long been on my bucket list to drink champagne in Champagne and so I convince the gang to stop. It’s 1 oclock in the afternoon but the village is a ghost town, shops are shut up and there isn’t a soul in sight. 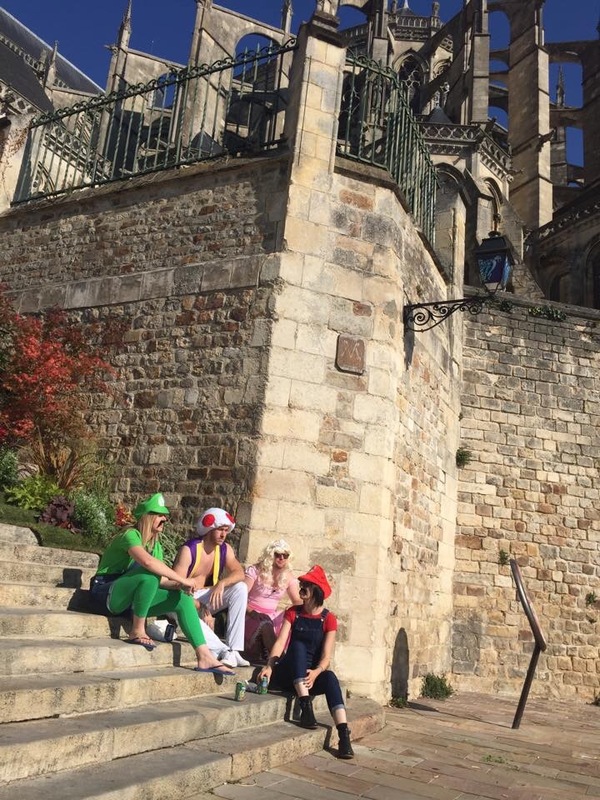 After ten minutes of driving around in disbelief we find a tiny bar with two locals sitting drinking outside, unperturbed by the glare of the locals we venture in and try to negotiate in pigeon French the purchase of a bottle of champagne. The barman offers the bottle for fifty princely euros. I step in as a skilled negotiator, 40EUR I counter with confidence. ‘Non’ he barks and wanders off to start cleaning the glasses. Feeling abashed I bung him the fifty for the overpriced lambrini. 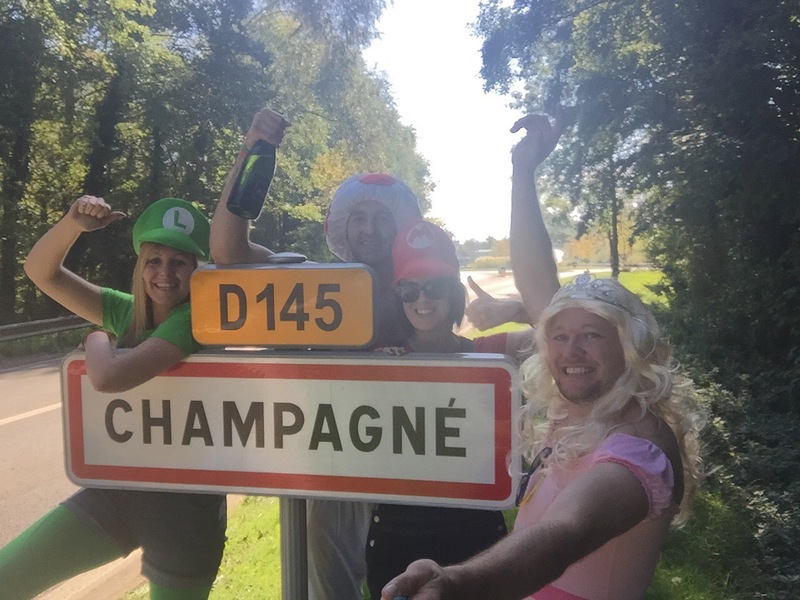 We find a ‘champagne’ sign and take one of the most expensive selfies ever with the prized bottle. Still, a bucket list item ticked! (I later will learn that this isn’t the official Champagne at all and in fact some potty parochial imposter). 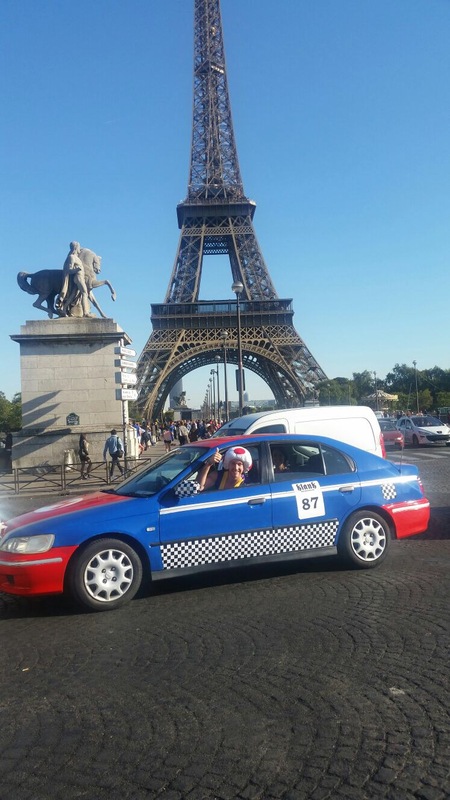 Regardless we speed on up to Paris for one of the more hairy legs of the journey..
Lionel has set us a challenge of taking a group photo in front of the Eiffel tower and arc de triumphe and so we must venture into the centre of this bustling city in our red and blue beast. 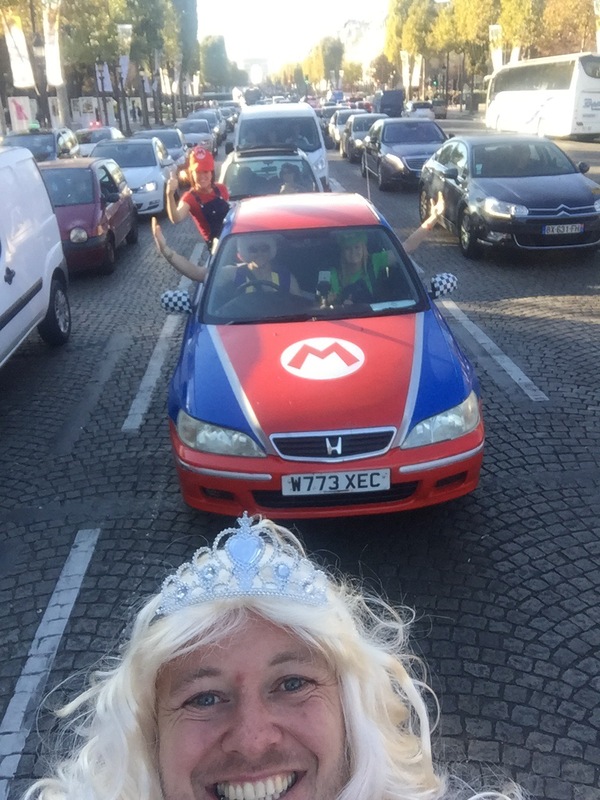 Princess Peach takes every opportunity in traffic queues and red lights to leg it out the vehicle for some death defying selfies. The traffic in Paris is pandemonium and just as soon as you see a space it’s been filled by a vespa. We’re told Putin’s in town so security is heightened and there are convoys of black tinted Mercs circling us. 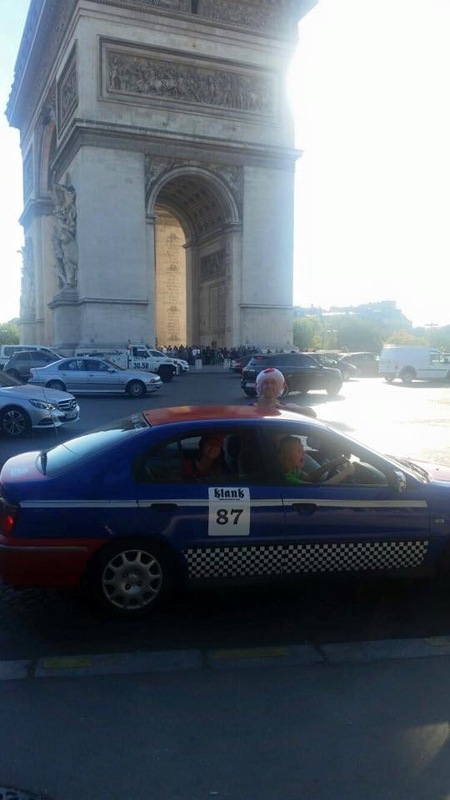 I am in the driving seat for the arc de triumph, the infamous roundabout that no insurance policy will cover. My objective is solely to keep the car in one piece. I enter the thirteen lane roundabout with clenched bum cheeks and it is utter bedlam. There are no rules on this roundabout, it is all about survival. I feel like I am actually in an N64 game and after a few laps I start to relax a bit, it certainly helps being in a cheapy motor. Unscathed, we arrive at our first campsite just outside Paris, pitch the tents and head for some beer and food. After some drinking games with the rival marios we head to the tents tipsy and ready for day three’s shenanigans.